Expectedly, the overall shape of Mahatma Gandhi’s hand and fingers reveals his breadth of vision and pragmatism. People with such dispositions are never narrow minded. They are also unselfish, so much so that they tend not to think of their own problems, and tend to dwell on those of the world and of society. It is known that Mahatma Gandhi neglected his domestic life for the sake of India, and the explanation of this is in his hand. It is not that he did not care for his family, he simply thought they were less important. the shape and setting of his Jupiter Finger. 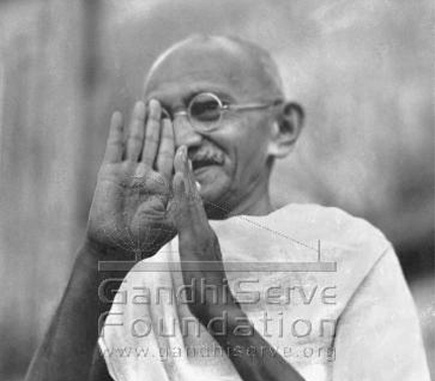 This sign often shows humility, but not everyone who has this sign is humble; the humility in Gandhi is confirmed by a stronger sign - the shape of his thumb and its setting. His inner timidity also enhanced the humble nature. Check out a photograph of his hand here. Two other well known aspects of his character are clearly etched on his hand. The shape of his fingers, particularly that of his phalanges, tells us that he was a disciplined man and that he had terrific self-control. They show a lack of interest in status symbols and money. They shows that his mind was always alert, curious and inquiring. Physical pleasures and other personal needs were not given importance. Gandhi did not care about hoarding money and had no interest in status symbols. He was not personally ambitious either, in the sense of wanting power. However, the shape of Jupiter finger read in combination with the quadrangle and thumb, tells us that although he had no personal ambitions, he was a controlling man. He liked to have his way at all times and could be very stubborn. He found it difficult to see another point of view once his own mind was made up. However it is important to note that his idealism, impressionability and compassion and also objectivity (shown mostly by the thumb and also hand shape) made him receptive to people who were suffering and in need. This softened his stubbornness to some extent and vice versa. His hand shows that his stubbornness decreased as he grew older. His long well-set thumb also shows determination, and a very strong will. Such people naturally rule. In addition his Mars Mounts tell us of his mental strength, quiet aggressiveness and resistance. The setting of his thumb shows his generosity and compassion and a deep desire to help others. His thumb is supple and conic, and this combined with the conic tips of Jupiter and Mercury, the flexibility of his fingers and their first phalanges, reveals his idealism and impressionability. This means that Mahatma Gandhi would never be blind to suffering. He would always be attracted to the ideal and would fight for it. Every sign on Mahatma Gandhi’s hand points to the fact that he was a genuine spiritual leader. His lack of interest in worldly pleasures, in money, the lack of personal ambition, presence of strong idealism and his deep compassion for human beings. His broad outlook on life as well as his strong will power and determination made him an effective leader. Personally, he could have been a little difficult to get along with, but he was an intelligent man and this helped. The lack of good photographs of his hands means that I have to stop here. It is known that Mahatma Gandhi believed in non-violence (Ahimsa) and I am sure this is evident on his hand but without a better hand photo I cannot comment on this aspect of his character. Read about other Spiritual Leaders. Check out the hand analysis of Mother Theresa or a comparison of the modern spiritual leaders with the ancient or older ones. Nice post Nita. Coincidentally, I am reading a book on Swami Vivekananda who shares many traits with Gandhi. They shared the same characteristics - both 'sacrificed' their personal lives for the greater good of the Indian people.Both were spiritual leaders, kind, compassionate and idealistic. Hope you do a future post on Vivekananda - it will be great to see if their hand readings have some common traits. Thanks Padmini. It's always interesting to know how well the hands of public figures match what is already known about them! At times one finds out that they are not genuine. In MG's case ofcourse there is no doubt that he is genuine, but even then it was good to know that his hand matched his known traits. About Vivekananda, I would love to see a photograph of his hands and I have done a search but not a single photo of his full hand! A real pity. It's a pity that you were not able to present the photo of Mahatma Gandhi's hands. 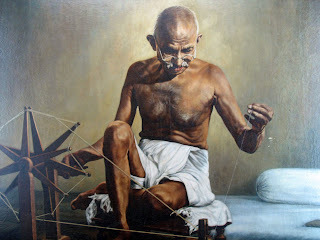 But coincidently, two week ago I created a short tribute to the hands of Gandhi - including a few pictures of his hands!! PS. Maybe you are interested to join the 'Global Palm Reader Network'? - You can do that via facebook at: http://groups.to/palmreading/ , or via my own website at: http://www.handresearch.com/directory.htm . Please, feel free to contact me if you're interested in those projects. Martijn, I read MG's hands from the very photos you posted on your blog, but from another site. However I cannot post them here as I am a little wary of not owning the copyright. I usually use picapp free photos or tiny photos from the person's website. I am a devotee of the late famous sivananda of rishikesh . Could you check his hand and let me know your readings. He was one another considered by many to be truly genuine swami of his times. hps, if I find good photos of sivananda of rishikesh I shall surely do the hand analysis. If you have any photos, you can send them to me. hello Nita, seeing that you read Gandhi's hands, would you please read the hands of the late Shri Mataji Nirmala Devi? she was a twice Nobel Peace Prize nominee and founder of Sahaja Yoga Meditation. When she was a young girl, Mahatma Gandhi recognized her deep and special qualities, and she often stayed in his ashram. Thanks for the links which you sent. Will take a look at them and see if I can use some of the photos. I have Nirmala Devi on my list but so far have been unable to find suitable photos. I hope the ones you have referred me too can be of help. Thanks. Divya, you can either subscribe to my posts via email or like the page on facebook. This way you can keep track of the posts. I am not sure whether I can read Nirmala Devi's hands. I have not studied the photos but I am going to.